"Android client + iOS client + mobile ticketing background management (BMS) + mobile ticketing server". • Android mobile phone client: run in the Android phone, provide service to the people. This system is convenient to users for inquiring real-time train ticket information, and can update and release comments real-time for passengers to see the latest information which improve the passnger interaction and use feeling. • iPhone mobile phone client: run on the iPhone,provide service to the people. The functions are same with Android client. • Background management system (BMS): belonging to Web client program, it's made for the use of the ticketing company internal maintenance/management personnel, can visit through the browser in PC. It's mainly used to manage and maintain the mobile phone client contents and data, and provide decision support through the comprehensive summary analysis data. A) provide the service to mobile ticketing background management and all mobile phone clients, also can intergrate and dock with the existing ticketing business system through the application integration interface. B) China has the great user group, especially during the Spring Festival travel peak, concurrent traffic may reach ten millions or even hundreds of millions, so the server should be deployed by cluster server made of dozens of high performance of server, provide load balancing and fault transfer function, avoid visiting congestion or system paralyzed. --advice, the construction of the server cluster need not be one-time built, but according to user growth, and make prediction, construct server clusterin several stage. A) background management system and the server consist of B/S structure, then the application server is also the Web server. 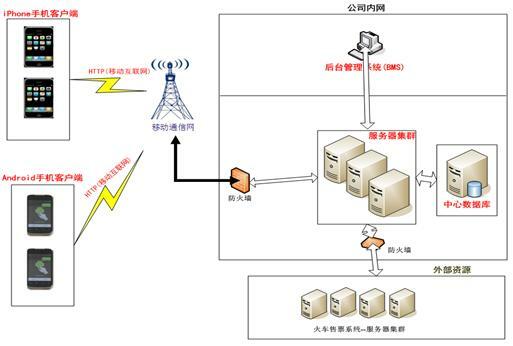 B) mobile phone client and server consist of C/S architecture.